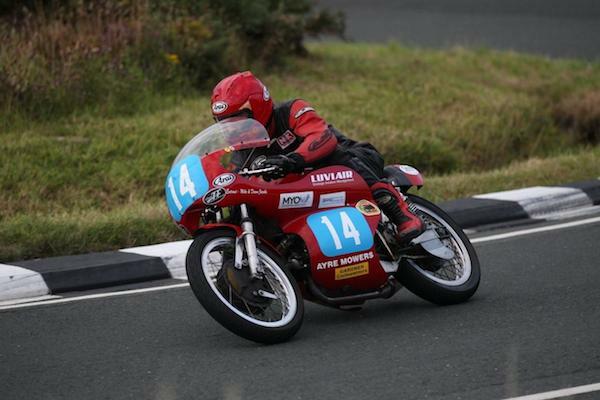 Allan Brew at The Skerries 2014 Classic Motorbike Run. Allan Brew writes: “Practice Friday – The forecast wasn’t good but the first couple of sessions (modern) were in the dry but then the rain started! For some strange reason the club then abandoned the schedule and just went for the next 30 riders, all classes except classics. We were told that the classics would be last out and have 2 sessions. It turned out we only got one session, so I only went out on the Aermacchi. The sessions were untimed so the race grid positions would be decided on current championship positions, which for me meant, 3rd row for the 350 and 2nd row for the 500. Race Saturday – Better forecast and just showers! The showers started just as race 3 left the paddock, i.e. the 250/350 classic race. Instead of waiting 20-30 mins for the downpour to pass, they started our race. It wasn’t good and I had a couple of big slides so just concentrated on getting a finish, 7th. At least, I now have all the results I need for my mountain course licence ! I managed to test the G50 for a couple of laps at the back of the 125 race before the 500/1000 classic race. I got a good start and was 5th into the first corner and by the end of lap 1, up to 3rd behind 2 1000 bikes. The races are started in waves depending how many bikes are on the grid and when I formed up, I looked behind to see Ed Manley and thought he was in the 2nd wave. Skerries is Ed’s home circuit and I’ve never beaten him around there. So even though I was first 500 at the end of lap 1, I had to keep going and not ease off. Richard Ford (1000) retired from 2nd at the end of the next lap, so starting lap 3, I was 2nd on the road. I then made a mistake and ran out of brakes at glasshouses and hit the deck! They red flagged the race and that was that. That was my second mistake, because the first was thinking Ed was in the 2nd wave when he had actually started with me and I was beating him fair and square and didn’t need to push quite as hard.